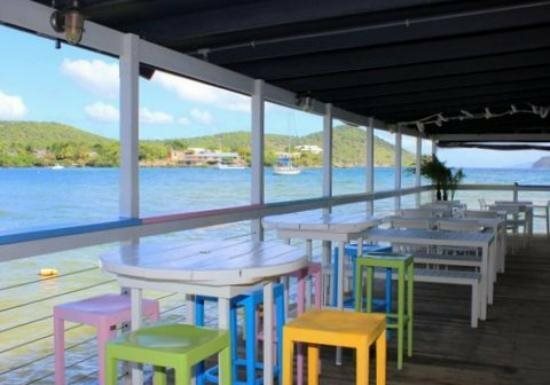 The Shoreline Bar and Grille is the restaurant at Point Pleasant Resort in St. Thomas, in the US Virgin Islands. More than any other restaurant, it really is right on the shoreline, where you can sit just five feet from stairs down to the water. You could even come to the restaurant by boat. 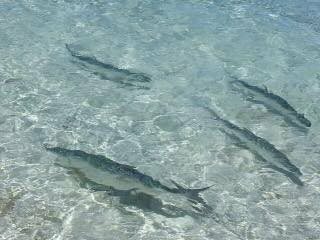 And it’s within waving distance of Margaritaville and a short walk to Coki Beach and Coral World. For tourists like me who prefer to avoid the crush of the capital city of Charlotte Amalie, that makes it the best region in St. Thomas to stay. The restaurant is brightly colored, with weather-resistant wooden tables. A bird, possibly a heron or an egret, waded in the water right up next to our table, and our waiter encouraged us to throw chicken wings out to tarpons, the giant but harmless fish that can measure three feet long or more. They went crazy for the treats! 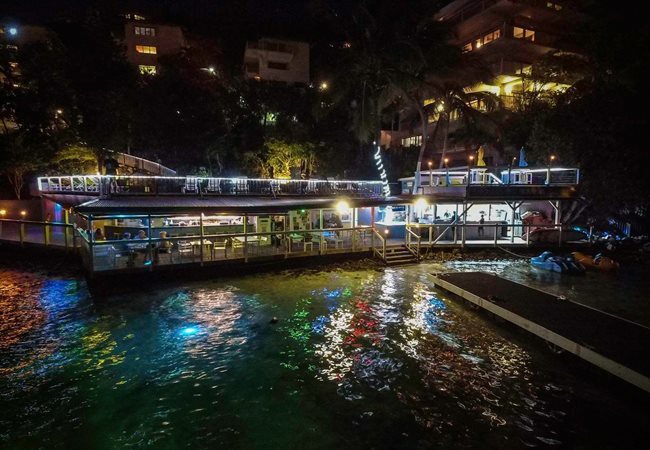 Shoreline is not hugely upscale, with its water served in plastic cups with lemon, but it is friendly and inviting, with colorful lights strung all over and an island feel. 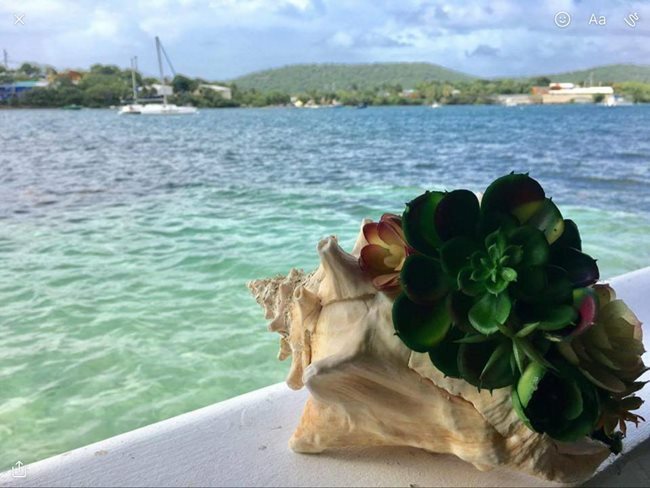 We had a conch shell on our table. The side railings and ceilings are wood, painted white, and its walls are pastel colored. The open air restaurant has stunning views. We can see the open ocean but we also see all the hills and the nearby small islands. (After dark, of course, there is less to see, because islanders turn off their outdoor lights so that it doesn’t disturb wildlife.) The views really couldn’t be nicer and we happened to be come just as the sun was setting. The menu was not extensive, but many restaurants still recovering from the hurricanes of 2017 are still expanding their selection, and staff were animated and helpful in describing the dishes to us. This being a resort restaurant, of course they serve breakfast, with French Toast, Vegan Bruschcetta, Crab Cake Omelet, or a “Benny” (eggs benedict). For lunch and dinner, find Calamari and Beer Battered Onion Rings for appetizers, salads including a Glazed Sesame Tuna Pineapple Salad and Frutti Salad, which has plum tomatoes and feta cheese. They offer sandwiches including a Classic Cuban Sandwich, Portobello Wrap, quesadillas, veggie burgers, and hamburgers. For entrees, try Fish Tacos or BBQ Platter. Driving into Point Pleasant Resort is hair-raising, with winding roads overlooking a long fall, and one without a guard rail. We found the chairs uncomfortable, because their armrests prevent the “man spread” of one’s legs. We got a virgin mango smoothie and strawberry smoothie, which were delicious: thick without being too sweet. And tried the Spicy Wings appetizer with buffalo sauce, which come with cabbage and carrots. The wings were juicy and neither the chicken nor the sauce was too greasy. Instead they had a sharp, almost acidic, taste. The raw carrots help get the juices off of your teeth, like a natural toothbrush. We also tried the Wylla’s Mussels, which are New Zealand mussels in a white cream sauce with tomatoes and bacon. They come decoratively presented in a circular bowl with balsamic vinegar. We loved the garlic bread soaked in sauce. We also tried the Tuna Tartare, an off-menu item that seemed like an appetizer rather than an entree. It was raw chunks of tuna (think sushi), sometimes marinated, with pita chips, seaweed, and teriyaki sauce. The closed wedges of pita bread were excellent, but because it came toasted, you couldn’t open them to scoop up the tuna, and they did not soak up the liquid. We found it hard to get the tuna onto the small bread pieces, and the cold tuna was too alien for us. The Fish and Chips are served with slaw on a white circular plate, with wonderfully thick steak fries, which they prefer to call truffle potato wedges. Interestingly, the tartar sauce comes underneath, rather than on the side. We loved how the chips were so thick, coming with a great potato taste, and the fish was hearty as well. Sometimes with fish and chips, the layer of fish is so thin that when you are done deep frying it there’s almost nothing left and the balance is not right. While they weren’t to die for, they were our favorite dish and came with a creative twist. Also get the Puertorican Ripe Plantain Mamposteado Bowl, which seems like jambalaya rice with a cream sauce on top, served with the same slaw in a bowl. Its pieces of plantain and sweet with a great, smooth, mouth feel. You can mash the moist rice and plantains with your tongue without even needing to chew. But the dish needed more spice. Without as many notable dishes or variety as elsewhere, the Shoreline Bar and Grille is a 4-star restaurant. 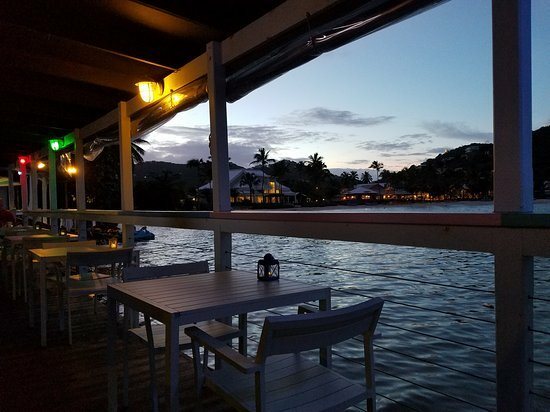 However, its combination view both distant to the ocean horizon and close up to wildlife is unrivaled, the best restaurant view in the US Virgin Islands. And you can feed the fish! I’m glad to give Shoreline Bar & Grille an excellent 4.5 stars. See the Shoreline Bar & Grille web page at Point Pleasant Resort.